Paris, the city of lights is also known for having more hotels than any other single town. 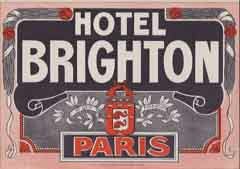 Telling the history of its first class hotels or illustrating the full body of its luggage labels would need a knowledge much more encyclopedic than mine, a site much larger than I have, and certainly a much, MUCH more comprehensive collection than my own. 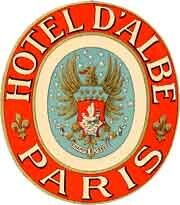 So, I decided to make a cut in 1910 and illustrate a choice of labels of the most important Parisian hotels of the time as well as a few others of particular interest. In the beginning there was the London Exhibition of 1851 and the French wish to do it better and on a greater scale than their neighbors. 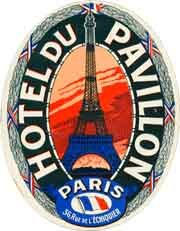 The successive and increasingly ambitious Universal Exhibitions held in Paris in 1855, 1867, 1878, 1889 and 1900 were powerful motifs for urban development and a boost for the hotel industry. But the origin of the modern Parisian hôtellerie can be brought back to an earlier time, to the first Hotel Meurice, founded before 1820. 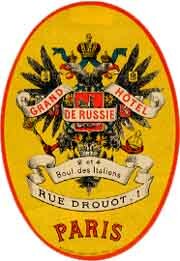 The hotel that existed in 1910 was the result of a total reconstruction (in 1906-07) of the earlier hotel of the same name that occupied several buildings in the Rue de Rivoli. To speak of Parisian hôtellerie in the XIX century is to speak of the brothers Pereira (Péreire, in French), capitalists and entrepreneurs extraordinaires. Of Portuguese origin, the Pereiras established themselves first in Bordeaux and then in Paris where they soon made a reputation for farseeing entrepreneurship. 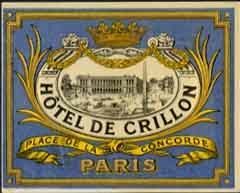 It was the lack of proper lodgings in number to welcome the expected visitors to the first Universal Exhibition to be held in Paris that lead emperor Napoleon III to invite the Pereira brothers to build a grand hotel of majestic proportions worthy of the reborn French Empire. The result was the Grand Hotel du Louvre (1855). 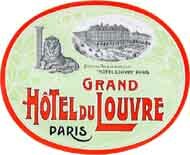 The Grand Hotel du Louvre reigned supreme for the better part of a decade until it was superseded by a new endeavor by Emilio and Isaac Pereira, of which more later. 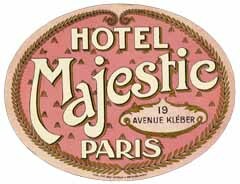 In 1875 the hotel was sold to a departmental store (The Louvre Galleries) which gradually cannibalized its premises in benefit of the store. 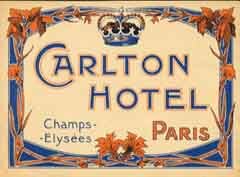 In 1886 a hotel on the opposite side of the Place du Palais Royal was bought for use as annex to the Grand Hotel du Louvre and it is this annex, later expanded with the acquisition of another contiguous hotel, that since 1887 carries the name of Hotel du Louvre to this day. 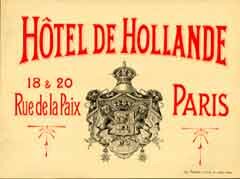 The next hotel that the society headed by the Pereira brothers built was to be named "Grand Hôtel de la Paix" but there was another nearby hotel named "Hôtel de la Paix" and its owners insisted on the exclusivity of the name. So, the new hotel, completed in 1862, ended up named, simply, "Grand Hotel". The 700-plus room leviathan was erected in only 15 months by working nights under arc lighting- probably the first major construction work to use that solution. Even larger and more luxurious than the Hôtel du Louvre, it was the first hotel in Paris to boast a hydraulic lift. In 1878 one of the lifts of the hotel fell from one of the upper floors on to the ground, killing three. All Paris was moved by the terrible accident. 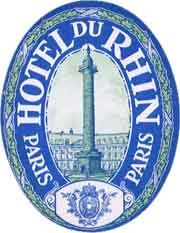 At the turn of the century the entrances were redesigned and the main entrance changed from the Boulevard des Capucines to the Rue Scribe and the hotel acquired the general appearance it bears to this day. Its Salle Des Fêtes is arguably the most spectacular hotel banquet room in the world. The Hôtel Continental was the next major hotel to be built in Paris. It opened on June 6, 1878 in time to attract business from visitors to the great Universal Exhibition of that year. As the train became more and more a preferred means of transportation so the French authorities (always with a flair for grandiose public works of a monumental nature) saw fit to build new terminal stations and re-erect the extant on more ambitious proportions. A number of Station Hotels sprung, naturally, from the new conceptions of multipurpose station buildings that had been heralded by the British. 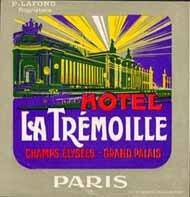 The most remarkable Parisian railway station hotels were the Grand Hotel Terminus (1889) on the Gare Saint Lazare and the Palais d'Orsay (1900) on the Gare d'Orléans (today Museum of the Quai d'Orsay). 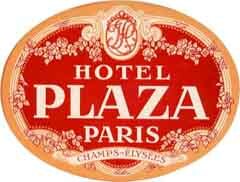 Other remarkable Parisian hotels founded before 1910 were the fabled Ritz (1898), the Elysée Palace (also of 1898), the Majestic (1908) and the Hôtel de Crillon (1909, but housed in a much earlier palace), the Athenée, located near the Opéra, that opened in 1867 for the Universal Exhibition of that year and the Plaza which, with the former would be in the origin of the famous Plaza-Athenée of today. Most labels at this time were printed by Boutillier.